Edinburgh is an amazing city. We are proud to be based in, and to serve customers throughout Scotland's capital. As an Edinburgh business we can sometimes take for granted what is on our doorstep. Often it's only when visitors come that we see things afresh. So, we thought we'd like to share some local knowledge with those of you visiting the "Athens Of The North", highlighting what we think you shouldn't miss. And for those of you who live or work in Edinburgh, this page may act as a reminder of some special places that you should revisit. Enjoy! If you are looking for something active to do, this should be one of your day trips. Imagine hiking up the side of a 2,000 year old hill where you can see wildlife, city views for what seems like days and volcanic geology that has been internationally recognised for the volcanic geology that it possesses. This beautiful enchanting place is located in Holyrood Park and I promise you won’t be disappointed. However, do bring comfortable walking shoes (trainers (sneakers) or hiking boots) so that your feet don’t get too tired. Because castles should always be visited, you need to make sure you stop here. It’s not just any castle either. You have the ability to see three separate military museums, the Scottish National War memorial, the Prisons of War exhibition, and it’s the home of Scotland’s crown jewels. You can, and will, probably spend an entire day here. You can even have your afternoon tea there. Maybe they have little cucumber sandwiches too? This is something that you shouldn’t miss at all if you are going to be visiting the area. This will get you from Arthur’s Seat in Holyrood Park to the Edinburgh Castle. However other than Holyrood’s Park you also will be the Palace, which is where the Queen resides in Scotland. Now if you are looking to get your drink on, particularly Whisky, this is going to be the place to walk around. Many shops, always busy and with plenty to see, bring (again) your walking shoes. Maybe an idea would just be to wear your comfortable walking shoes at all times, because anything other than that, especially heels, are not going to hold up on these roads. So you want to see what our military is about? Check them out. It’s a show that rivals that of that of any prestigious military band with some of the most talented performers, drummers, and fireworks (because who can say no to fireworks). This is something that you really can’t miss if you visit, but if you are planning to see them, make sure you get your tickets early so that you can actually get in. You definitely wouldn’t want to go here and miss this. Also the backdrop of the castle is priceless. Your trip won’t be complete without stopping by Old Town. As the name leads you to believe it is an older historic town that has been kept in fabulous condition. There are shops, churches, places to eat and drink, etc. 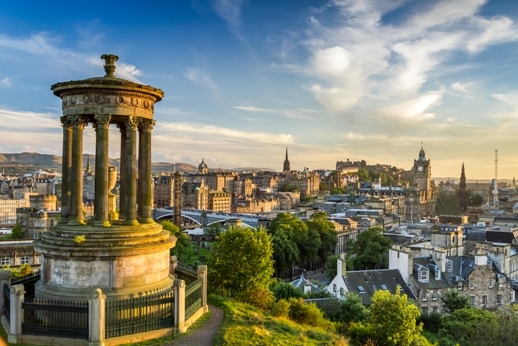 It’s the perfect place to go to see the history of Edinburgh and how it all started. Plus, if you are one of those really healthy people (vegans and vegetarians) there are restaurants that are dedicated for your palate. If you go on a Sunday you can even get some beautifully fresh produce and other items. Seventy-Two acres of peace and tranquility that’s located in the city center. This place has been around since 1670, which is a long time. It’s literally one of the best in the world. It’s not just someplace to see in the summer or spring either; it’s beautiful any time of the year. If you are looking for quiet after going to other places throughout the city, this is the place to go. And just like Arthur’s Seat, you’ll want to bring comfortable shoes as 72 acres is a lot of space. Of course I have to say something that everyone will enjoy. The children will not be bored here, and neither will you. At the top there is a 360 view of Edinburg and a rooftop terrace. But below that is where the magic happens. We’re talking about five floors of illusions and hands on experiences. Plus you can come and go as you please once your hand is stamped. So if junior is getting tired, you can go back to the hotel, nap, eat, and go back. Plus if you don’t see everything you can get a pass to go back the next day without paying another fee. The best part? If you hate it, you can get your money back, but I doubt that will happen. Just as an FYI though, it is not handicapped accessible, so if you can’t do stairs this most likely isn’t the place for you, but if you can, definitely try it. Because not everything can be sunshine and rainbows, there has to be at least one place that you go that shows you some of the bad parts of history. Seriously this place would be it. Yes, it’s done with actors and special effects and rides, but it gets into the history of Scotland that can be funny but also scary at times as well. This is a ‘short’ attraction at about an hour and a half, but then you can always go out to get some gin or whisky afterwards. Just don’t bring the babies (literal babies that is), and bring a sense of humor and prepare to be scared. Definitely something that you have to try. Because I know there are people that love their drinks. And when you go someplace new, especially a country, you always have to try out a local spot that makes and sells their own stuff. This place would be it. Everything is produced in small batches and you can even do a tasting, try making your own, and learn about everything while you are there. I mean what better way to end a good day than to try out a local Gin distillery? I truly can’t think of a better one. You know I can’t leave the whisky drinkers out of this, there is also one of these. Learn about how they make the whisky, get into the vault where there is literally the largest selection of whisky in the word and get to tasting. So if you are into Whisky go here, Gin, go to the previous distillery, but all in all, just enjoy every moment of your trip to Edinburgh. You’ll enjoy it so much you’ll want to come back.